Mystery on Enceladus: What Drives Saturn Moon's Icy Plumes? An enhanced color view of Enceladus that shows the "tiger stripes" in the moon's southern hemisphere. The famous geysers seen erupting from the surface of Saturn's striped moon Enceladus are a striking visual feature, but a scientific mystery. A new model may finally explain what sustains these eruptions. 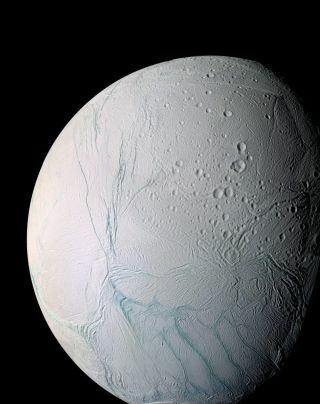 First spotted by NASA's Cassini spacecraft in 2005, the geysers erupt along Enceladus' "tiger stripes," or fissures, in the icy surface around the moon's south pole. There are multiple outstanding questions about the geysers, such as how they can continue to erupt over longer periods of time, and why they don't freeze over. The new model shows how tidal stress from Saturn could help solve the puzzle. The liquid that spews skyward from the geysers on Enceladus likely comes from a subsurface ocean. Tidal forces — the same kind responsible for the tides on Earth — exerted on Enceladus by Saturn, could cause the water in its subsurface ocean to spew upward, creating the geysers. This image shows geysers erupting out of the surface of Saturn's moon Enceladus. But observations show that the eruptions reach their peak five hours later than would be expected if they were caused by a simple tidal force. Scientists have previously proposed that the delay is due to of the fact that Enceladus' outer, icy shell is relatively soft, but the new model doesn't require that to be true. The new model suggests that deep vertical "slots" may be located between the icy surface of Enceladus and the water below. If the slots were wide, the eruptions would happen very soon after the tidal force goes into effect, the researchers say. If the slots were narrow, the tidal forcing would take longer. The observed delay of 5 hours comes from a size of slot that is somewhere in between, the scientists said. "In between, there's a sweet spot," Kite said. The tidal forces laid out in the new model could also heat the water and the ice shell via turbulence, according to the statement. That could explain why "the fissure system doesn't clog up with its own frost," Kite said. And why "the energy removed from the water table by evaporative cooling doesn't just ice things over." That conclusion could be tested by an analysis of observations from Cassini's recent flybys of Enceladus. Data from Cassini could show if the south polar ice has been heated or if it's cold. If temperatures between the cracks are found to be warm, this would imply that there is some additional source of heat. But if the space between the cracks is found to be cold, that would confirm the model's predictions. Cassini is not expected to fly that close to the moon again before its mission ends in 2017. A paper based on the research was published March 28 in the Proceedings of the National Academy of Sciences.